I remember as a young Christian I used to hear about fighting the fight of faith and I thought it meant that I would have to conjure up strength within myself to stand strong against whatever came at me as a child of God. The more I tried to do what I thought was fighting the faith fight, the more defeated I became. Things were not changing and so I figured I either was not fighting enough, or I did not yet have enough faith. The truth is fighting the fight of faith does not involve our own personal strength, but in fact faith knows that in our human weakness, that is when we can become quite strong. The more I grew in my understanding of the Word, I began to see clearly how satan has gotten so many Christians to take up a fight in their own strength, which will never lead to a victory in Christ. As a matter of fact it will usually just wear you out. You often hear believers say they have to be strong, or that they are fighting against something that has come against them. When you look to scripture you begin to see that the fight of faith has nothing to do with us battling against what we may be facing, for scripture reveals that Jesus has already defeated our enemy. If this is true what are we fighting? Col. 2:15 He stripped the rulers and authorities of their power and made a public spectacle of them as he celebrated his victory in Christ. 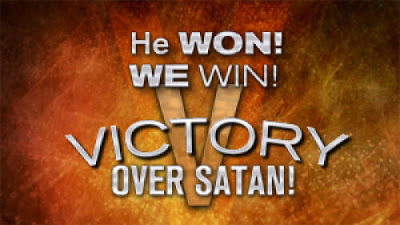 Through what Christ did for us God stripped the rulers of darkness and of course satan himself of their power, and even made a public spectacle of them through Christ’s victory. It is like going into a ring where a champion boxer has already knocked out our opponent for us, but then we come along and try to get them back and to fight against them ourselves. In fighting the fight of faith we actually keep satan where he belongs, under our feet. So let’s learn just what this fight of faith is so that we can walk in the victory Christ has already given us. 2 Cor. 4:13 The following is written, “I believed; therefore, I spoke.” We have that same spirit of faith. We also believe; therefore, we also speak. For us to understand the fight of faith we simply need to define what faith actually is and how it works. This is where people make their mistake. Even though most could tell you what I am about to share about faith that does not mean we are walking by faith. As humans we tend to drift back into doing things the way man does things, and not the way God does things. Even if you know what faith is and how it works we are told in scripture to examine ourselves to see if we are in the faith or not. Often you hear people say they are believing God for something, but upon further examination of what they are saying and doing it is quite clear they are not walking in Bible faith. If we are not then we are not fighting the fight of faith. Paul gives us several very important keys here in 2 Corinthians 4:13 about faith. First of all he tells us that we have been given the same spirit of faith. Some actually don’t think or don’t act as if they have the same faith as Jesus Himself had, but they do. There are not several types of the god-kind of faith. The faith you received when you got born again for we are all given a measure of faith is the same. It is not different from someone else’s. The second key element Paul reveals here is that faith first believes. This means faith is convinced of what God has said. But the word believe here means we have believed, we are believing, and we will continue to believe. 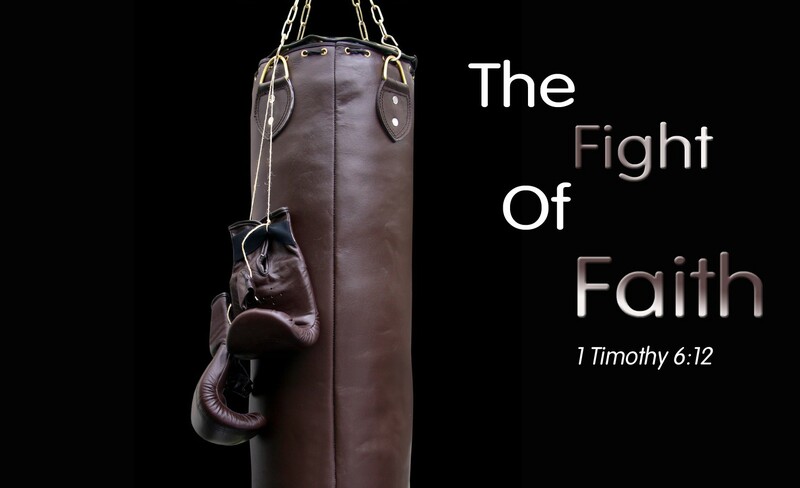 To fight the fight of faith you must be convinced in what God has said about a subject. This comes from hearing the Word of God. Not what we have heard, but what we keep hearing. This is important to walking by faith. Whenever we are faced with something that has come against us as a child of God we need to know what God’s Word says about the matter. This is one of the reasons why living in God’s Word is so vital for our walk of faith. We are to look into the Word of God and as we find scriptures that give us promise of what Christ has done we must then take those truths and meditate on them as the Bible teaches day and night. This means we continually speak them to ourselves and ponder them over and over. Jesus taught us this in the gospels for He said man does not live by bread alone, but by every Word that proceeds from the mouth of God. He is giving us a comparison revealing that the same way in which we feed our physical man we must feed our spirit man. We do so by chewing on the Word of God, meditating on scripture. If we don’t make the effort to do so until the Word becomes a part of our inner consciousness we won’t be convinced of what God has said. Many don’t realize that what is true of the natural is a type of what is true in the spirit realm. When you take food, chew on it, and then swallow that food gets down on the inside of your body. The body then goes to work drawing the nutrients out of that food to give you what is needed in the natural. So it is with the spirit man inside, the real you. Your soul is a part of your spirit. You are a spirit, you have a soul, and you live in a body. When you feed on God’s Word (meditate on it) you are chewing that Word with your soul. As you do it begins to go down on the inside of your spirit man providing the spiritual nutrients to build faith within you. Once that faith in the promise of God is developed you will be convinced of what God’s Word says about you. Until then you will lack what you need to fight the fight of faith. The third thing Paul reveals to us from 2 Corinthians is that faith speaks. Just believing is not enough. Once faith rises within us we must then speak what we know is true. Faith calls those things that do not exist as though they did. Faith doesn’t say one day it will be, faith says it is so now. As Hebrews 11:1 states, “Now faith is the substance of things hoped for …”. Faith is now. God operates obviously in this same kind of faith, which in Romans 4:17 we are told that He calls what does not exist as though it did. One of the ways we can know we are fighting the good fight of faith is seen in our confession. As I mentioned earlier we may say we are believing God for something, but what do our words say. Are we calling things that don’t exist as though they do, or are we speaking contrary to God’s Word? Let me point out here that it is not our confession that changes things, but a faith filled confession. As we are building faith we should be speaking to ourselves what God’s Word says. We should be declaring to ourselves what He says is already so. You see for example healing does not come first in the natural; it comes through your spirit. Residing in every born again believer is the same power that resides in Christ Jesus. We have the same Holy Spirit He has. It is this power that needs to get through our souls and into our bodies, which will bring healing. When we know we have been healed according to what Christ has done revealed by the Word, then our confession will agree with the Word. This is what must happen for faith to work. We are not fighting against the sickness in our body, we are fighting against the feelings in our flesh and our thoughts that try to convince us it is not so. When we know healing is ours and speak in line with the Word declaring it done we are on the way to receiving healing. Last but not least faith does not just believe, faith does not just speak, faith also acts in line with what it knows is true. To walk by faith you must act as if the Word is so. Your actions are what bring forth the power into operation to see your situation change. When you are in faith, convinced of what God has promised, your confession will declare it already done, and you will have corresponding action with your faith. Without the corresponding action faith becomes destitute of power, inoperative and dead. You can’t just believe, you can’t just speak, you must also act. Heb. 6:12 so that you may not be sluggish, but imitators of those who through faith and perseverance inherit the promises. When you fight the good fight of faith you do not fight against whatever has come against you, you fight against thoughts, feelings, and what you may hear from others that goes against what God’s Word says. You are consistently believing, speaking, and acting in line with God’s Word. We are told here in Hebrews to imitate those who through faith and perseverance inherit the promises. The word perseverance here means to be consistent at it. You are not just to be in faith for a couple of days and then go back to speaking or acting out of line with what you have believed. We are not supposed to visit faith every now and then; we are to live by faith. So make sure you are fighting the true fight of faith. You battle is not against sickness, diseases, or other storms of life because Jesus victoriously conquered our enemies. Our battle is with what we think, what we feel, or what we may hear, making sure we don’t lose our faith in God. We need to make sure we do not lose our confession in His Word, calling things that be not as though they already are, and making sure we keep acting in line with the Word. Those who are consistent in fighting the good fight of faith win. They partake of the promises they have inherited in Christ. That is the reason it is a good fight, because it is a fight we win, because Jesus has already won the battle for us! Hebrews 4:12 For the word of God is living and powerful, and sharper than any two- edged sword, piercing even to the division of soul and spirit, and of joints and marrow, and is a discerner of the thoughts and intents of the heart. 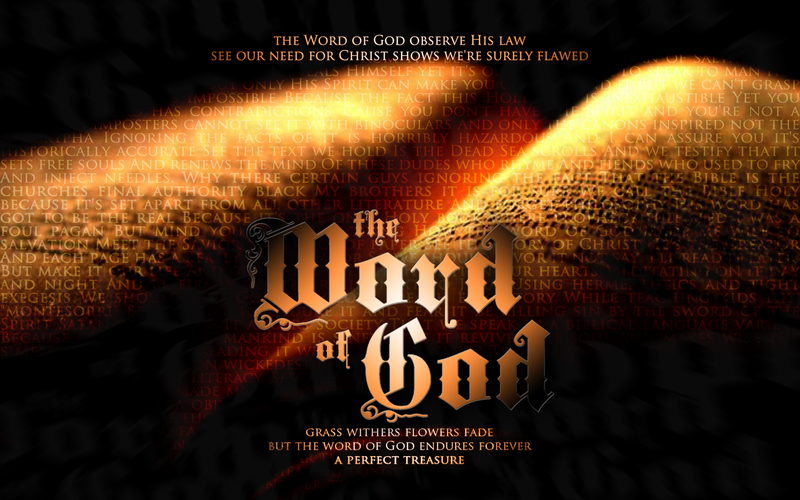 One of the most vital and powerful elements in the life of a believer is the Word of God. The Bible is not a collection of writings that man came up with; it is in fact inspired by God. God and His Word are one, so it stands to reason why the Word of God is so powerful. Once again the Word of God is coming under attack from some places you would not expect. There are ministers who are now saying that it is not relevant for today. Others state that the Old Testament is not for us, that it has no application to our lives since we are now under the New Testament. Some are even going so far as to say that any Old Testament quotes in the New Testament do not apply to us, that the words of Jesus spoken before He was raised from the dead don’t apply to us, and that there are other parts of the New Testament in which it is just the apostle Paul rambling about the law. It is obvious when you look at all the benefits that scripture has in the life of a believer why satan would deceive people to say such things. If I were the devil knowing what the Word will do to empower Christians to overcome his works and to put him under their feet I would hire every preacher I could to discount the importance of God’s Word. The more I could use these voices to make light of the scriptures the more you could keep believers from learning who they are in Christ and thus defeating the devil and his cohorts. Wouldn’t it make perfect sense from the devils perspective to do so? No Christian should ever focus only on the Word and never take time to draw near to God in the spirit, but as scripture reveals the best way to develop our relationship with Him is by allowing Him to speak to us through His written Word. As Kenneth Hagin said many times, “The written Word reveals to us the Living Word.” I want to share this week some of the most important truths about this powerful wonderful Word of God and what it can do in the life of a believer. 2 Tim. 3:17 that the man of God may be complete, thoroughly equipped for every good work. To begin with we need to recognize something very important about scripture. All scripture has not only been given by inspiration of God, it is profitable. What is profitable? All scripture is profitable, not just the New Testament. What most don’t seem to understand is the Old Testament is filled with wisdom from God, instructions that still can be applied today, and the ability to learn more about God through the relationships He had with those in the Old Testament. If the New Testament is the only thing that would be profitable for us then 2 Timothy 3:16 would tell us so. But in fact as verse 17 above states you become thoroughly equipped for every good work through all of scripture, not just the New Testament. I will be the first to tell you that as a believer in Christ we should in fact spend most of our time in the New Testament learning who we are in Christ and our rights as a child of God. But when people refer to the Old Testament as the law they are showing their ignorance about scripture. The only book in the Old Testament that is actually the Mosaic Law is the book of Leviticus. That’s it. So we need to realize that the entire Bible is God-inspired and profitable for every New Testament believer. We clearly no longer have to live by the Mosaic law, but the whole of the Old Testament is not the law. John 1:2 He was already with God in the beginning. John 1:14 The Word became human and lived among us. We saw his glory. It was the glory that the Father shares with his only Son, a glory full of kindness and truth. Back to a statement I made earlier, the written Word reveals the Living Word to us. Jesus is the Word of God. When you pick up your Bible it is one of the greatest ways to fellowship with God. God’s Word is God speaking to and revealing Himself to you. I hear Christians say all the time, “I wish God would speak to me.” He will, just pick up your Bible. When you spend time in scripture you should not do so as a religious duty to read so many chapters a day, but it should be a time you come to fellowship with the Lord. You will be amazed if you make a daily routine of spending time in the Word how many things you need answers to will get addressed just by spending time in the Word. If the Lord is important to you then the Word will be important to you. Scripture teaches us that we should imitate those who through faith and patience inherit the promises. In other words look to the great men and women of God who don’t just claim to know God; they are those who have seen God working in and through their lives as He has said He would. I know many believers who say they know God, yet they have not experienced much of what He came to do in their life or through their life. Jesus said we are to go and preach the gospel, we are to cast out demons, raise the dead, lay hands on the sick and they will recover. If you really get to know God you are going to be doing these very things He sent us to do. One such man of God who experienced these works in and through His life was a great apostle named Smith Wigglesworth. Remember scripture says when you find someone who is walking in what they have inherited, what Christ is wanting to do in and through us, you should imitate them for they could not do such works if they were not following scripture. This great apostle of God made the following quote about how he came to know God and continue to grow in his relationship with the Lord. If you want to get to know God intimately and in a very personal way His Word will play a vital role in that relationship. Even Kenneth E. Hagin who followed in the same footsteps of Smith Wigglesworth taught time and again about how vital God’s Word is in our life. Would it not be obvious that satan would not want us to know God for who He truly is? So how would he keep us from getting to fully know God? Just get preachers and believers to make light of the Word. Why would any believer after being born again want to continue to live like the world? In 2 Corinthians 4:4 we find out that satan is the god of this world. To live like the world means to continue to live under his influence. God wants us to walk in victory over the world and it’s ways. To do this you have to be transformed in the way you think. If you don’t renew your mind to change your thinking to God’s way of seeing things, you won’t experience the good and acceptable and perfect will of God. The most important thing for every believer to become all God wants them to be is to continually renew your mind to God’s Word, especially who God says you are now as a child of God washed in the blood of Christ. Prov. 4:20 My child, pay attention to my words; listen attentively to my sayings. Prov. 4:22 for they are life to those who find them and healing to one’s entire body. God’s Word will bring healing to every part of your body. People like Kenneth Hagin, John G. Lake, and Lilian B. Yeomans just to mention a few proved this to be true. God’s Word in verse 22 of the Hebrew language is said to be a medicine to all our flesh. One of the easiest ways to be healed and walk in health is to do what Proverbs tells us here. Pay attention to God’s Word, listen attentively to it, and do not let it depart from your sight, guard it within your heart and it will bring healing to your entire body. There are many benefits that come from the Word of God. Scripture teaches us that if you hide God’s Word in your heart you will not sin against God. God’s Word will bring forth light and understanding expelling darkness and confusion. As we have talked about it is one of the most important factors in developing an intimate relationship with God. It will help you to know and experience the good and acceptable will of God for your life. It is medicine to all your flesh and so much more. So don’t fall for the modern day preachers who make light of God’s Word. The devil certainly doesn’t want you in the scriptures because he knows the entire Bible is God-breathed and profitable for you. Fall in love with the Word and you will deepen your love for God for the Word and God are one. Have you ever thought about how much time and attention has been given to keep bad people who are out to do harm from taking advantage of our families and rightfully so. There are all types of alarms available as well as monitors, and of course guns, not to mention online protection from hackers as well. Society has done a lot to provide protection from such people, but as believers how much attention do we give to our spiritual enemy and how he works? We may not even think much about these spiritual enemies and in not paying attention to them and how they work, they can subtly move in and take advantage of our lives. I want to share this week some very important things we can do to give this enemy of ours no place in our lives. First of all let me establish a couple of very important facts. The first of which is the fact that our foundation scripture reveals a very important truth for us to understand. If Paul tells us to give the devil no opportunity to work in our lives that means he cannot do so unless we give him that opportunity. Far to often Christians have given satan a whole lot more credit than he deserves. Realize that he cannot work in our life if we will not permit him to do so. Don’t think for a minute that he can just come against you and do whatever he wants, not unless we give him such opportunity. We can slam the door in his face every time he comes. The second key point I want to make is the fact that God stripped satan and his cohorts of their power through the victory of Christ on the cross. We need to fully understand this truth because far too many Christians are even afraid to talk about the devil for fear that he might come against them if they do. First of all he has no power left. He has to deceive you to take advantage of the authority Christ has given to us. Jesus Christ delegated to the church the same authority that was given to Him. The power of God that defeated the devil is still God’s power, not ours, but when Christ gave us His authority that means we have the ability to use God’s power. We should have no fear of the devil for he has been stripped of his power. Why then does the devil seem to take advantage of believers? There are three primary areas in which he works that we will go over so we can learn how to address these in our life and make sure we give him no place. The three primary areas in which satan works are deception, seduction, and the cares of this world. If we recognize these works we can slam the door in his face and keep him out of our lives. So let’s look at each one individually and learn how to be victorious over anything he may throw our way. Rev. 12:9 This great dragon—the ancient serpent called the Devil, or Satan, the one deceiving the whole world—was thrown down to the earth with all his angels. In Revelation 12:9 we clearly see that the devil is a deceiver of the whole world. He works to take advantage of us by getting us to believe things that are not true. He is continually at work in the lives of people trying to convince them of things about God that are not true. If he can convince you that it is God who makes you sick or God who brings bad things in your life or it is God who uses evil to teach us then he can deceive you and keep you from receiving what God has for your life. One of the primary areas satan has worked to bring such deception in people’s lives is through false teachings from the pulpit. John chapter 10 reveals this very truth. So how do we keep from being deceived? Jesus gives us the answer in John chapter 8. If we abide in His Word, we are His disciples (students learning from Him), and we will know the truth, and the truth will set us free from deception. Abiding in the Word is more than just reading the Bible. The Amplified translation brings out in verse 31 above that we are to hold fast and live in accordance with Jesus’ teachings. Knowing the truth refers to knowledge through action. Reading scripture is not enough we must live by it. It wouldn’t do you any good for example to just look at food. You don’t get nourishment from looking at food you must eat it. We must take God’s Word and meditate on it, and put it into practice if we want to overcome the deceptive works of satan. The problem with deception is you don’t know you’re deceived, and that is why we must abide in the Word of God. Stick with the Word and it will never lead you astray, but if we oppose God’s Word that will lead to deception. Seduction is different then deception for when someone is seduced they know what they are doing is wrong. Seduction is satan’s way of tempting us with things that our flesh wants. If we give in to seduction we know what we are doing is not right. This is the work of satan’s seducing spirits, which leads people away from the faith. This refers to not putting our faith in what the Word says, but instead giving in to what our old fleshly nature wants instead. Gal. 5:16 Let me explain further. Live your life as your spiritual nature directs you. Then you will never follow through on what your corrupt nature wants. If for example you don’t want to adopt all the stray cats in your neighborhood, then don’t put out cat food for the cats. If you feed them they are going to hang around and keep coming back for more. If you don’t want them around stop feeding them. If you don’t want to give in to seduction, being tempted in your flesh, then stop feeding your flesh with all the fleshly worldly things that others watch and participate in. Instead feed your spirit man and watch your spirit begin to dominate your life. Then when fleshly temptations come you will choose to walk in life through the spirit instead of corruption through the flesh. One of the most overlooked areas where satan is at work in people’s lives is in getting people to live with the cares of life. This leads to worry, and Jesus said there is nothing good that will be added to your life through worry. As a matter of fact you cannot walk in faith and worry at the same time. Notice Peter here clearly states that we are to humble ourselves under the mighty hand of God so that He can lift us up above the circumstances of life. We do this by casting all, not some but all of our care upon Him because He cares for us. This is significant because what Peter is saying here is that God wants to help you deal with and overcome the things that become a burden or care in your life. Notice the very next verse warns us to be sober and vigilant in dealing with cares because your adversary the devil walks about like a roaring lion seeking whom he may devour. He devours people by getting them to carry the cares of life. How do we release these cares to God? You must make sure you are not in love with the world nor the things in the world, for those who are the love for the Father is not in them. If you will maintain a close and intimate relationship with God you won’t have any problem trusting Him with life’s cares for you know He cares for you. So make sure you are abiding in the Word of God, living in and living out what the Word says. Keep developing your spirit man for as you do you will walk in the spirit and not fulfill the lusts of the flesh. Make sure you are maintaining a close walk with God because then you won’t hold on to the cares of life but in fact life a care free life. I don’t ever personally recall talking to any believer who has a heart to know God who did not want to know they were pursuing God’s will and wanting to fulfill their God-given purpose in life. Wanting to do so and doing so is a fine line. Fulfilling the will of God is always hands down the most rewarding thing any believer could ever do, but it is not always what we initially think. I want to share with you the words of our Savior that was one of the most important things He was trying to get across to His disciples as He was personally facing a time of temptation in His life to walk away from what God’s will. I have been in the Garden of Gethsemane and it is a place that is a little difficult to describe. While we were there we had time to pray alone and in that time of prayer it became a time of reflection for me on what Jesus really went through. It is hard to imagine going through such a time of temptation that Jesus literally sweat drops of blood. The temptation was to be pulled out of God’s plan for His life. Not just going to the cross, but for the first time ever to be separated from the presence of the Father. When we stand in the fullness of God’s presence we will understand more fully why this was so difficult for Jesus to face. We know clearly that the battle going on here was to actually do one of two things. Fulfill the will of the Father, or fulfill what was Jesus’ will of not being separated from God. Jesus clearly states this fact in verse 39, “O My Father, if it is possible, let this cup pass from Me; nevertheless, not as I will, but as You will.” Jesus did not get His own will. He chose the will of the Father over what He willed, and here is the example we are to follow when it comes to our lives if we desire to fulfill what is God’s will for us. The alternative is to fulfill our will instead, which will not result in living a fulfilled life. I can tell you as I am sure we can all testify to, that every time I wound up doing my will instead of God’s it never came out right; and yet many times where I have obeyed God and it did not seem to me in the natural the right thing to do, God always accomplished what needed to be done. That in no way means that I always saw that. There is so much more to life and the lives of others God wants to touch through us, that we rarely see all that God does or is doing when we are walking in the will of God. When we are not walking in His will we have limited His ability to work in us and through us. God cannot bless what is not His will. He never has and never will be able to do so. For Him to work in and through us we have to work with Him. This is why Jesus said He only did those things He saw the Father doing. When I read letters like Paul wrote to Timothy telling him that Demas had forsaken him having loved this present world, and had departed Paul going back to Thessalonica, this was a disciple of Christ who was walking out the will of God for his life but he was pulled out of God’s will working with the great apostle Paul and went back to the world. It was not the will of God for Demas to forsake the apostle Paul. God could no longer at this time work in and through this man’s life because he had gotten out of God’s will. There are many others spoken of in the Bible who did not fulfill God’s will for their lives, but they could have. I want to be like the apostle Paul who at the end of his life was able to declare that he had fought a good fight, and he had finished his course having completed what was God’s will for him. That happened because of choices Paul made daily throughout his life. I believe Paul missed it at times as he admitted to the Corinthian church that he had not dealt with them about giving to the work of the ministry, and he even asked them to forgive him of this wrong. Along life’s paths that we choose to take it does not mean we may never make a wrong choice, but if we do we need to make sure to get back on the right one. Jesus in the Garden gave his disciples two golden nuggets of how to live our life so that we are not giving in to the temptation to get pulled away from what really is God’s will for us. Those two keys are to “Watch” and “Pray”. When you understand the simplicity of what He said it is without a doubt one of the most powerful and important things for every believer to learn if you desire to fulfill God’s will in your life. Remember, Jesus Himself did not get His will, He chose instead the Father’s will over His. To better understand the first key here to “watch” you have to look at the final words at the end of our foundation verse of scripture. The spirit indeed is willing, but the flesh is weak. Without this phrase we would be a little in the dark as to what we are to watch for, but this gives you the focus of what Jesus was saying. According to Romans 7:18 Paul states that there is nothing good that dwells within our fleshly nature, and the flesh is weak. If we choose to allow our flesh to decide what we will or won’t do in our daily lives we are going to give in to our fleshly nature that will always want to take the easy way out. As a believer if you desire to fulfill God’s will you are going to have to post watch on your flesh. If you don’t you will give in to its ways because of its weakness. Your spirit desires to do the will of God, but not your flesh. If you go through life making your choices based on your mind, will, and emotions, and you are not consistently renewing your mind to the Word of God, you will be tempted and led away from what is God’s will for your life. The flesh is weak so simply put when it comes to doing God’s will or your will; the flesh’s way out is always the easy way out. To go against the flesh is uncomfortable to say the least. Think about how many decisions we have made in our lives just based on how we feel at the time. How many times have we made choices in our lives based on our emotions, making a decision because we felt hurt by something said or done? This does not lead to fulfilling God’s will. The will of God will always be founded upon, backed up by, and in line with the Word of God. Scripture for example reveals that iron sharpens iron. Think about that for a minute. That is one hard object rubbing against another hard object. For example if I took the things that God has used my Pastor, Dr. Mark T. Barclay to speak into my life at times as anything other than God using this gift of a Pastor in my life to grow me up, it would be easy to get offended, which offense is of the flesh for offense is taken not given, and the result would have been me not being as sharp and accurate as God wants me to be. Unfortunately many in Christianity today think that the way you grow up in Christ is by hearing everything you want to hear, and getting things your way. But not even Jesus got His will over the Father’s. As Jesus stated if you do not want to get pulled out of God’s will for your life you must daily pay attention to your flesh. We must stop making knee jerk decisions because of what someone said, did, or the fact that our flesh did not get what it wanted. We need to stop and take the time to make sure we are not making a decision based on our flesh and not the Word of God. Any such decision will lead us away from God’s will. We also need to be honest enough with ourselves and not just use the old Christian cliché’ that we are obeying God. Does both scripture and true godly leadership whom God has blessed us with to help us fulfill God’s will agree with what we think is God’s will? If you study scripture you will find that there is only one primary way out of deception, submitting to a higher spiritual authority. If you have found such a leader in your life and you know they are gifted by God to help you why don’t we believe that they can give us godly counsel to keep us in the will of God? Many don’t for if they do speak to leadership about such major decisions, they don’t ask of their leadership if what they are thinking of doing is in line with God’s will, they tell them what they have already chosen to do. Christians are more apt to get professional advice and receive it from their doctors, lawyers, and others yet when it comes to spiritual matters of major issues never consult their leadership. To keep a watch on our flesh we need to make sure before we make a choice we are in line with Gods’ Word. The second key is simple, pray. Stay connected with God. Maintain a close relationship with the Lord. If I was not already doing so I would lean even more upon the spiritual leaders of my life initially to stay in line with God’s will. We must be honest once again with ourselves here. If we don’t spend much time in fellowship with God through His Word and prayer, how are we going to know His will for us? Just going to church on occasion or even consistently does not mean we are actually connecting with God. If you truly have a desire to know Him you must then deny self, take up your cross, and follow after Him.